Sixty years ago, when Chevrolet first introduced the Corvette to the world, it was as a happy-go-lucky roadster touted for its “fun” design and as a “joy” to drive. It was a car for “Mr. and Mrs. America,” built for the open road, handling “like an angel,” extolled NBC’s Today host Dave Garroway in a 1953 television commercial. Fast forward to 2013. It’s a rainy February afternoon. General Motors’ marketing pros are pitching the latest updates and additions to the GM lineup at the 40th Canadian International Auto Show. The all-electric Spark EV, the Canadian-built 2014 Impala, the 2014 Silverado — it’s all well and good. But what the crowd really craves isn’t some pedestrian, consumer-friendly four-door. They’re waiting for the Canadian debut of something exotic. A beast, specifically. The one strategically concealed at centre stage. 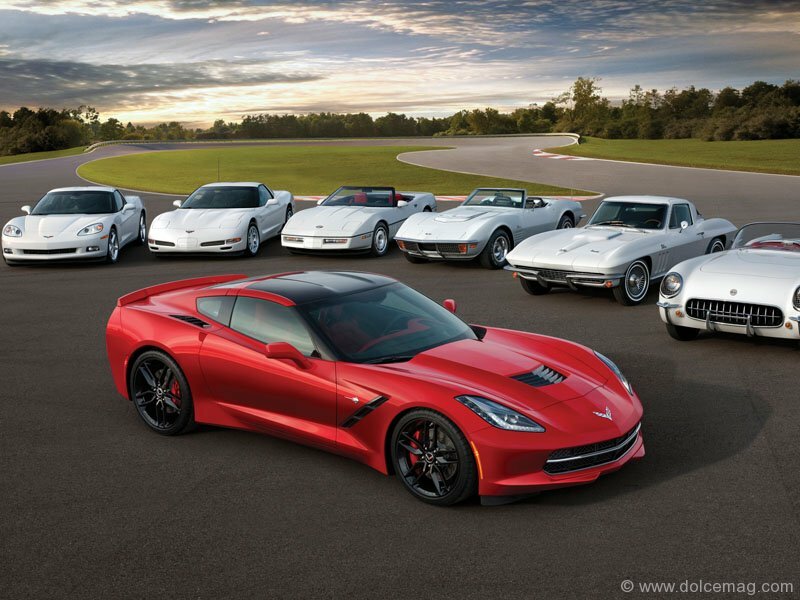 When the near 20-minute parade wraps up and the cover is whisked away, a pristine silver 2014 Corvette Stingray — yes, you heard right, “Stingray” — rolls forward. And, oh, how the times have changed. There is nothing angelic about what Chevy has created here. The C7 — as aficionados know it — is strikingly intimidating. It’s demonic and nasty, demanding of attention. Chevrolet has always maintained a sleek-and-sporty esthetic for their prized two-seater, but never with such viciousness. The rounded body of the more recent C5 and C6 versions is gone, replaced with razor-sharp lines and pronounced angles. Vents and inlets slice across the hood, fenders and panels — for performance reasons, of course. But the effect is dramatic nonetheless. The back end, too, has ditched curvature, dumping the traditional circles for rectangular tail lights, à la the fifth-generation Camaro. 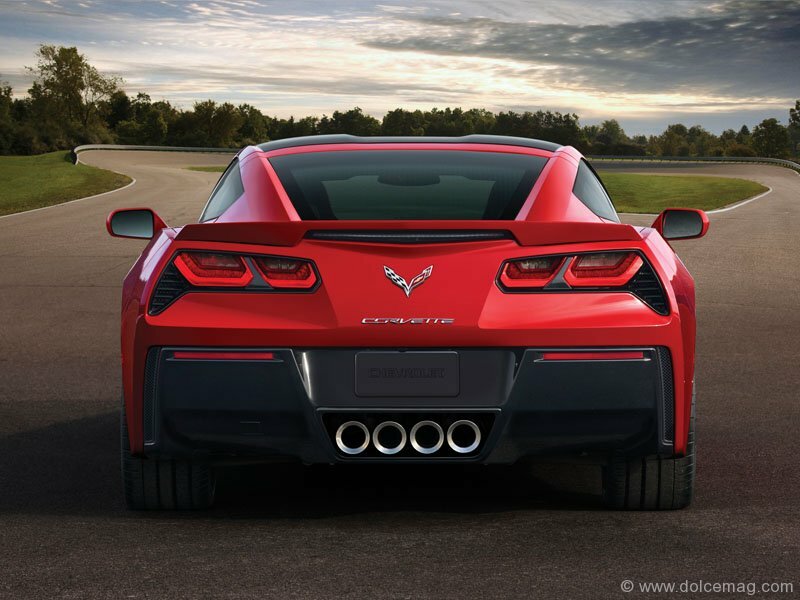 Much like the aforementioned Camaro, the new Corvette is unabashedly forward-looking. A departure from the approachability of past Vettes, it flies in the face of the homage-paying designs sported by other revitalized muscle cars, like the Ford Mustang and Dodge Challenger. Perhaps this is why its styling has been a matter of contention. Some might complain that it’s too Camaro-ish, too modern; out of sync with gearhead nostalgia. Indeed, the C7 is very youth-friendly, like some robot in disguise straight out of a Michael Bay film. And, of course, this was the point. During their conference, Chevy’s marketing gurus made it clear that Millennials had their attention (see the Tru 140S versus the Code 130R concept campaign for more). “Created to oppose the expected, abolish empty traditions and explore the unknown … Purpose alone is sacred,” reads the Corvette’s web page. And to solidify this fact, the tagline of its first official commercial: “Enemy of the same.” This new Vette isn’t a display of technology’s elegance. It’s hard, in-your-face modernism, “a beautiful weapon,” mechanical ferocity. But what is aggressive posturing without power? 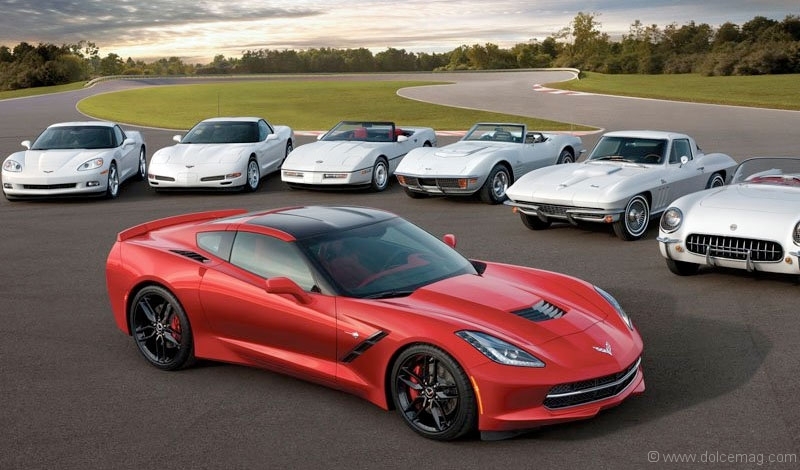 Chevrolet proclaims that this is the most powerful standard-model Corvette yet. Its new 6.2-Litre V-8 engine utilizes direct injection and variable valve timing to deliver 450-horsepower and 450 lb-ft of torque, powering from dead to 60 mph (96 km/h) in less than four seconds. It’s no wonder Chevy felt this Vette was worthy of the Stingray badge, an emblem not seen on a new Corvette since 1976. A six-speed automatic option will be available, but muscle-car buffs will side with the seven-speed manual. Chevrolet also developed its own rev-matching technology for the C7, which detects the slightest movement in the stick, anticipating gear changes to facilitate smoother shifts. Perhaps contentious tech to purists, but everyday drivers will likely welcome the support. The new Stingray also benefits from robust bodywork. Its new aluminum frame is reportedly 57 per cent stiffer than that of current Vettes while also nearly 100 pounds lighter. A carbon-fibre hood and roof help lower its centre of gravity. Coupled with a wider stance, longer wheelbase, lower roof, improved aerodynamics and 50/50 weight distribution, the C7 looks poised for solid handling. But while performance numbers may impress, GM claims this Vette will also be its most fuel-efficient. The C6 floated around 9 L/100 kilometres on the highway. 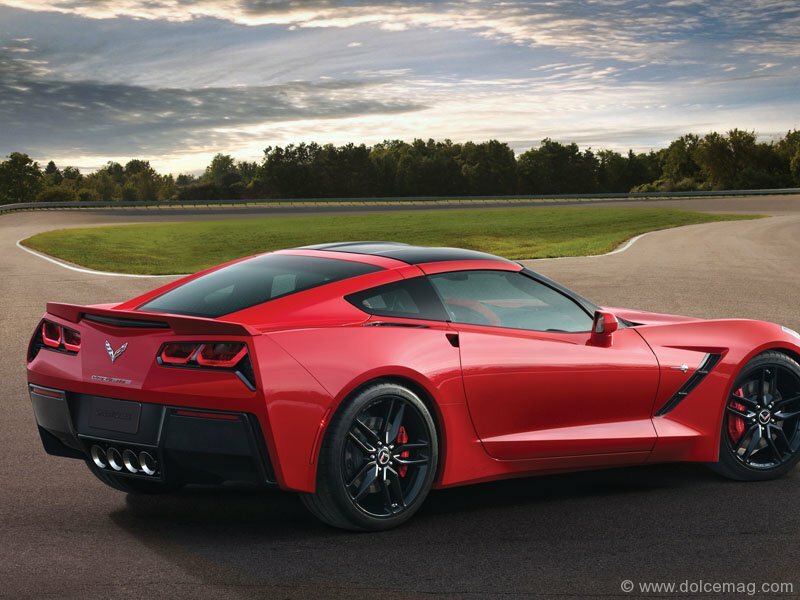 The C7 utilizes active fuel management, so expect improved numbers from the C7. Corvettes of the past have always suffered stark criticism for their spartan interiors. While still quite practical, the Stingray’s cabin feels higher quality without sacrificing driver focus. An eight-inch screen replaces conventional speedometers and tachometers, allowing for three display modes: touring, for navigation and fuel economy; sport, with a dominating tachometer; and race, which displays lap times, G-force and bar graphs tracking revs. Speed is projected onto the windshield in the driver’s line of sight. A drive mode selector, with five modes (weather, eco, tour, sport and track), adjusts 12 variables for different road conditions. A smaller, sporty steering wheel — with mounted paddle shifters — brings improved grip and feel. And a driver-angled, eight-inch, high-definition screen with Chevy MyLink mounts the dash. GT seats will also be available for extra support on longer drives, while Competition Sport seats are optimized for track racing. Leather trim, carbon fibre and aluminum also accentuate the cabin. While no price has been set, GM states that if the current C6 is within reach, the C7 will be as well. Love or hate its future-present styling, this fiendish-looking Stingray will ride, resurrected, sometime in the third quarter. The only question now is how wicked it will be.